Are you stuck at a point where you know about freelancing but unable to start it? A lot of people could start freelancing on the internet, but they are not starting just because they don’t know what they should do as a freelancer, or what they choose as a niche in freelancing. Some of them have multiple things in mind, and others don’t have a clear idea of their niche. In case, you don’t know what the niche is; then I’d help you understand that as well. 0.1 What is a Niche? A niche is a market segment with specific traits that differentiate it from other areas. For example, “iPhone users in Los Angeles” could be a niche if someone wants to focus on the customers and buyers and fans of iPhones in Los Angeles. That’s a niche. Now, you know what the niche is. If you’re wondering how to choose the niche in freelancing, then it’s the next thing I’m going to discuss in this blog post, but before proceeding, I’d like to ask you three simple questions about your perception of freelancing. Do you exactly know how freelancing works? Do you know that it takes time in getting freelance clients? Are you aware of how freelancers work online? If all three answers are in “YES” then you’re good to go to read this blog post, in case, you have doubts, then you should read this freelancing tutorial first, then come back to this blog post to finish it off. Your strength is something that makes you stand out. You don’t have to become a web designer if you aren’t passionate about coding and designing. Instead, you should try to find what you like the most. Your strength could be your passion or skill or ability. A lot of people fail to decide what their strength is. Finding your strength isn’t that difficult, and at the same time, it’s not a piece of cake either. Many of us have to work on it to finally understand what our strength is. Some people find it instantaneously, and others don’t. What does make you happy when you’re not working or studying? What can you do for the rest of the life without getting bored? What’s one thing that you love and wish you could make money off of it? When you start analyzing the answers to these questions, you’ll start to see the clear picture. Maybe, it’s cooking or playing badminton or Xbox or pet training that makes you feel better, and you love it. Maybe, you could build a business around that by using your expertise in that area as a freelancer. If you find it difficult to figure out your freelance niche, then start with the basic things; analyze what type of questions people ask you or what type of person they think you are, for example, bookworm, creative, entrepreneur, coding geek, or something else. It’s true that your friends and family know about us – sometimes more than we know about ourselves. So don’t underestimate the opinions of your loved ones, especially when they tell you that you’re good at this. Maybe, it’s songwriting, video editing, or playing the piano. It becomes easier to understand your strength when you start observing people’s queries toward yourself. If you’re the go-to guy for your friends regarding cricket information, then cricket knowledge is something you should take seriously and work on that to create a freelance gig regarding cricket. It’s absolutely fine to start doing something you love just for fun, but if you want to take it seriously, then consider making a monetization plan before going all in. For example, if you write your blog, and you think you should provide your writing service to others to make some extra cash, then you have to plan precisely what you’re looking forward to doing, for example, you want to offer freelance writing service to other blogs, or you just want to be a ghost writer in advertising. In fact, monetization plan includes whatever you have to do to cash in on your strength. It may require you to join a freelance platform like Fiverr or Upwork to get started with selling your freelance service. Once you know where the potential audience is, it becomes easier to make a start in a specific niche. 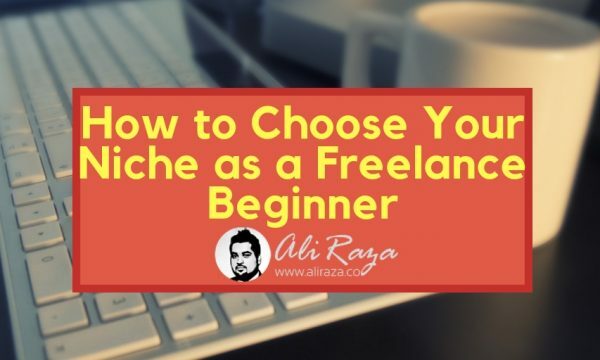 If you’re wondering to choose your niche as a freelance beginner, then this blog post could help you out because I have shared very basic steps that any freelance beginner needs to take at the beginning. The worst mistake any freelancer could do is looking at other freelancers and start offering the same thing as others — even without much expertise or interest in it. One of the reasons of writing this blog post is to tell you that many starters make this mistake; they start offering graphics designing just because others are offering and it’s working for them – if it’s working for others, it doesn’t mean it will work for you too. Maybe, your graphics designer friend is passionate about graphics designing for a long time, and now it’s working out for him. You don’t have to offer graphics designing on Fiverr if you don’t like it. In fact, if you’re good at making CVs, then you should offer CV making on Fiverr as well as your blog. It must be something you’re good at, or you love doing it. If you understand the fundamental idea of this blog post, you’re going to thank me forever. What else would you add to this topic?